David Kobia, founder of Mashada, a well known community website among Kenyans, just let me know of their newly launched site. Mashada was first created in 1998 and has 40,000 registered member, and has just been completely redesigned from the ground up. There are still some sections of the relaunch that aren’t finished. No word on when the classifieds and pictures area will be live. However, I’m quite impressed, this is one of the best community sites coming out of Africa today. It’s got a very healthy community of active users that make it their daily destination for conversation and news. 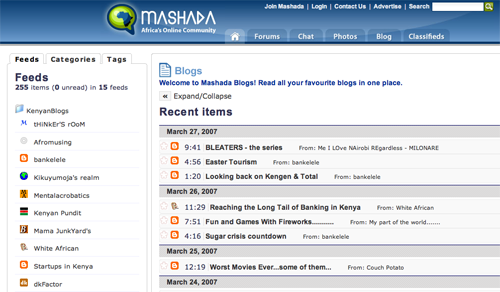 Kenyan blog aggregator (aren’t these all the rage these days!?) Particularly well done. Archived forums – with all of the old posts, so it loses none of its flavor – good job on this one! Mashada claims itself, “Africa’s Online Community”. So, I can only guess that David plans to grow it past the normal base of Kenyans to a wider web audience that includes more people from other African countries. Hey Joe, I think the Kenya Bloggers Webring is still a much needed platform for extending blogging to the Kenyan community. Having another blog aggregator just adds some choice to the mix. Personally, I think both serve a different demographic anyway, so both will do well. Hash i agree in a way .neo liberal leftist and their pro gay agenda,anti kibaki sentiments will need a home especially since mashada is an open forum that is none partisan . i think majority of kenyans will be on mashada because it willbe balanced and has a wider reach. As part of the diaspora, i must say that its good to see an online presence and a community in kenya. congrats to you all. Joe, I was thinking about what you said on biases. In a perfect world these web platforms don’t have biases at all. They’re just places where anyone can write (ex: Mashada forums) or blog and get it aggregated. On another point, as much as Mashada and KBW might seem like direct competitors – they’re actually not – they’re indirect competitors. Though Mashada has started an aggregator, their strength doesn’t lie in that, it’s in their forums. KBW also has an blog aggregator, but it’s strength has been creating a community sphere around blogging in Kenya. That’s why I think there’s room for both, they each own different spaces on the web: forums for one, blogging for the other. Hash I hear you! Mashada doesnâ€™t have a bias .It is a home for almost any view point you might have out there. The kbw issue is not a new one .infact it was after the Acolyte scandal that I wrote to David asking him to start an aggregator .At the time bloggers who did not agree with the powers that be in KBW were being harassed with emails that only KBW admin had access to . There was a lot going on at the time .Including a closet agenda to remove voices that dissented with the KBW Secret agenda .In fact I was not the first to be removed from the web ring and later others were removed. Those who specifically did not fit into an agenda that toed KBW unofficial line were unceremoniously shown the door. Mashada is here and it is the better option! I for one will say that I was amazed but glad to see a new aggregator up. I do agree that diversity is indeed needed. It was sad to see censorship creeping into KBW, like when a humourus post by udi poking fun at gays was pulled and the harassment of other members. I will not touch on my situation and how poorly it was handled as that is water under the bridge. Anyway at the end of the day it is all for the good of the Kenyan online community. The new Mashada design really rocks. Thx David! And thx Hash for blogging about it. Kisumujah this is the beauty of Mashada. Every one is entitled to their own opinion even the kids who “make it so painfully rubbish” after all don’t forget you were once a Kid ……. mashada is by far the best. Jamela,Jaykam,Mkono,Supuu, Mzalendo Mkenya and the rest of the crew are rocking the crap out of that website. Mashada is a place to relax,a place you meet all types of fellas.Its nice and may we all use it to our benefit.Get to know what others think about you and thus we will soon know that which hold us back towards each other.ONE LOVE GUYS.KENYA NI YETU SI YAO.AMA? When it comes to emergency well you get me up. em pleased with what you are doing, keep it up. you are welcome.